We ended up in the nice sea town of San Vito lo Capo, on the northern coast of Sicily near Trapani, by accident. We were supposed to go to the island of Pantelleria, but our flight got cancelled and we decided to go here instead. It was raining when we arrived, so we decided to have a full pranzo (lunch) like the Italians eat, rather than our usual snack for lunch such as a slice of pizza or Sicilian rice balls (arancini). We walked around a bit and noticed a “trattoria gastronomia tipica” called “U Sfizziusu” that was full of Italians and had local dishes on the menu like cous cous and busiate, the local fresh pasta shape. Both are good signs (there is no such thing as Italian food — each region has its own and restaurants that serve local fare are usually better and more interesting), so we decided to eat there and were not disappointed! In fact, we liked it so much for lunch that we reserved a table for the same day to have dinner there as well. 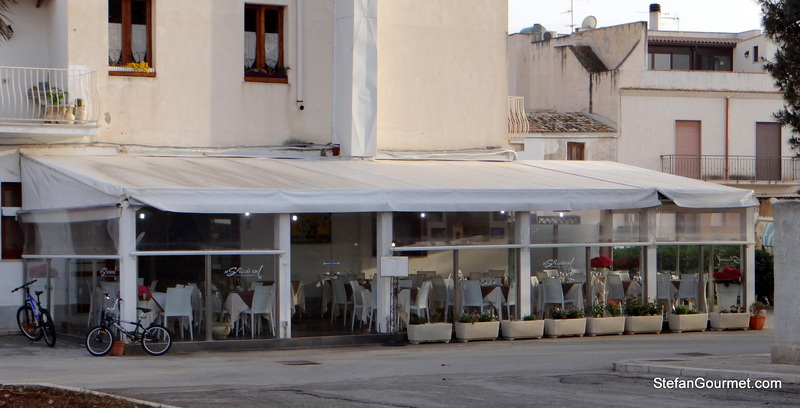 The restaurant has modest seaviews and outside seating on a terrace. 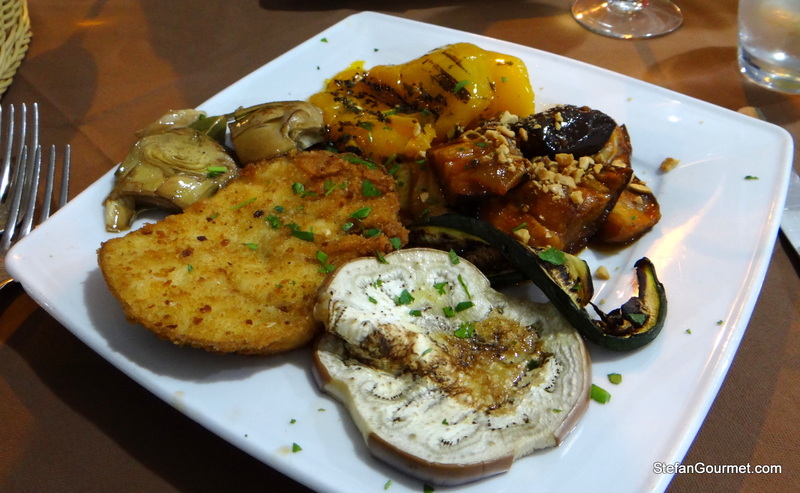 The menu offers a nice selection of seafood and vegetable antipasti, and here are the dishes that we tried during our two visits. Caponata. 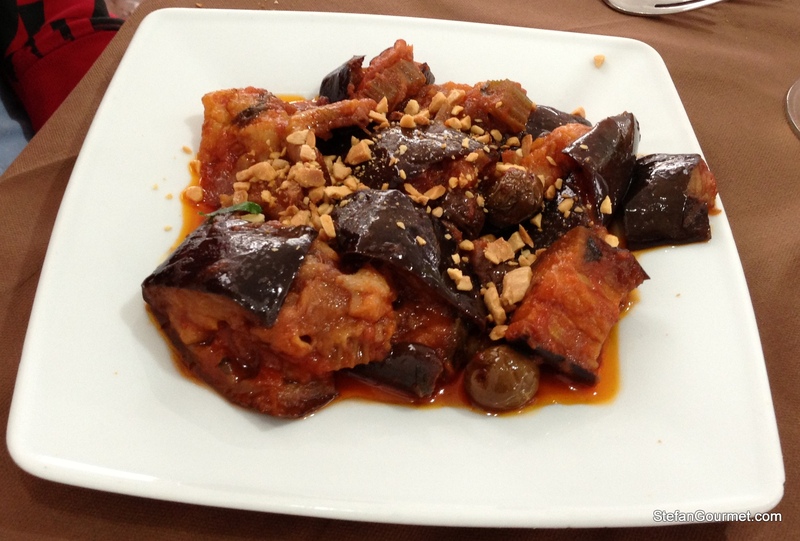 Eggplant simmered in tomato sauce with olives and roasted almonds. The eggplant is very tender without falling apart completely. Lovely dish. 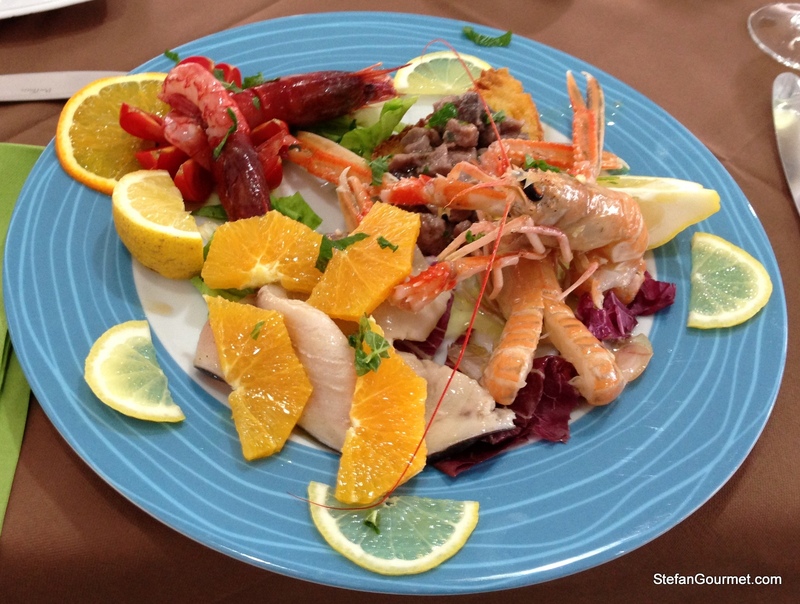 Raw seafood: prawns, scampi, swordfish, and marinated tuna with lots of citrus. Everything was very fresh and especially the prawns and scampi were very tasty. Mixed grilled vegetables: pink eggplant, breaded pink eggplant, zucchini, yellow bell pepper, marinated artichoke, and some caponata. Breaded shrimp: crunchy on the outside and tender on the inside. Shrimp is often overcooked and tough, but not here. 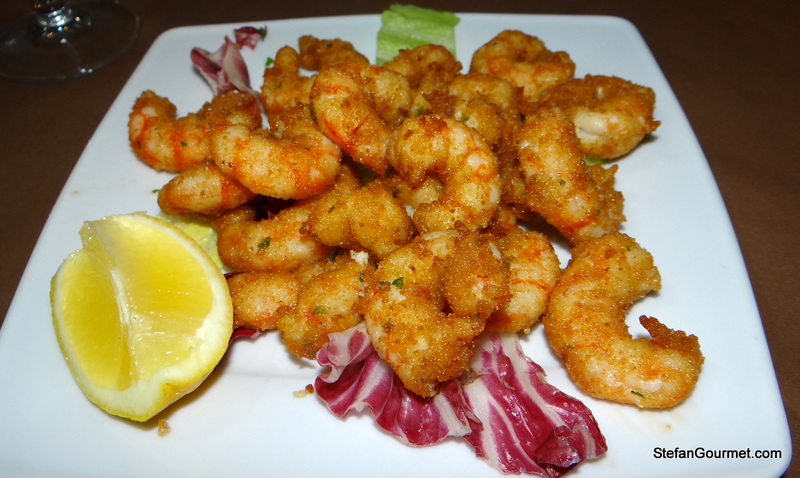 The shrimp was breaded with breadcrumbs Sicilian style (i.e. I suspect they had been fried before being used as breading). Busiate alla Trapanese. Busiate are the local fresh pasta shape, it’s like tagliatelle in a spiral. 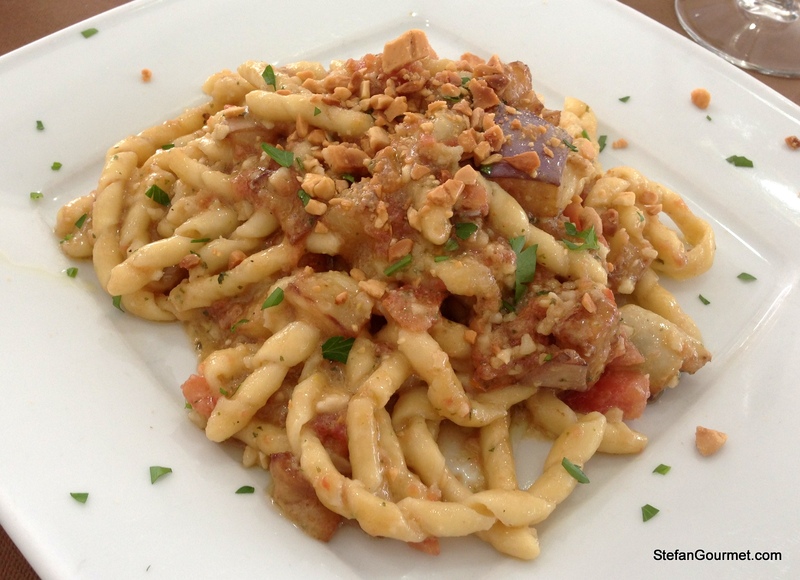 The local style is with fresh tomatoes, garlic, roasted almonds, and just a bit of pink eggplant. Very tasty. Ravioli in fish broth. 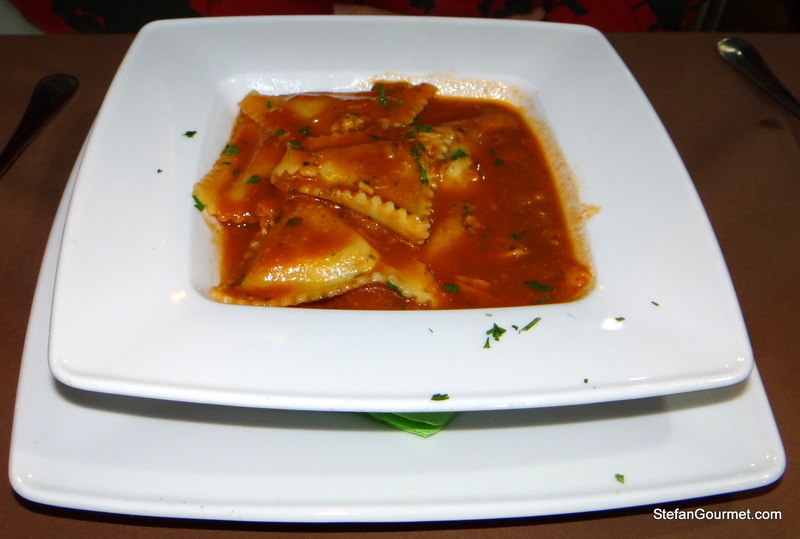 Nice strong tomato-fish broth with delicate ravioli. 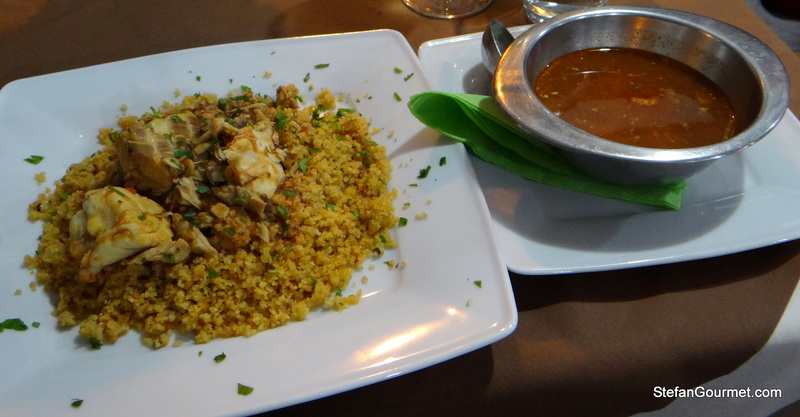 Cous cous with dentice (fish). Tomato-fish broth is served on the side so you can add as much as you like, and there are generous chunks of fish in the cous cous. 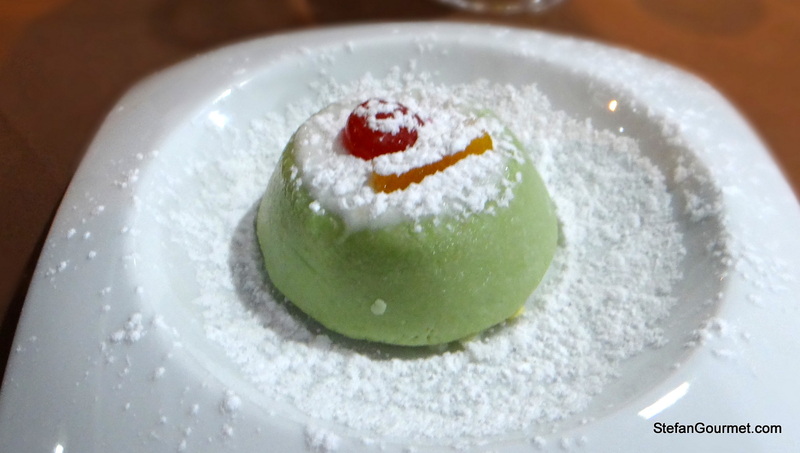 We only tried one dessert, but this Sicilian cassata was very nice. All in all a great seafood restaurant that serves Italian food like it should be: tasty, simple, and cheap. My only wish would be for them to upgrade the winelist. 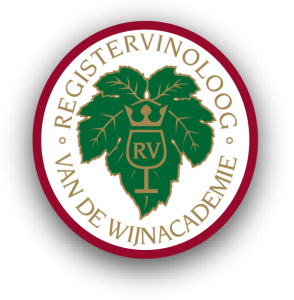 There are only five white wines available, with the most expensive being 18 euros. They are good but simple wines from reputable local producers, but those same producers also have more interesting and slightly more expensive wines and it would be nice to be able to order a bottle of one of those so the wines will be at the level of the food (which I rate a well-deserved 8/10). Re cooking Sicilian style, I use the Giorgio Locatelli book – he’s got 4 different recipes for caponata, all of which are lovely! San Vito lo Capo is also one of the nicest beach towns in Sicily.